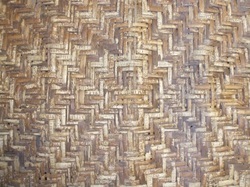 Ash splint, woven in a twill or herringbone pattern. Ash and oak are the most common wood specie used. 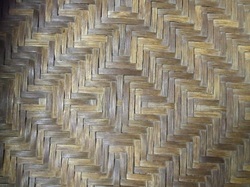 Slab cane, woven in a box pattern. It is rough hewn coming in widths 6-10mm. This is common on hickory (log or rustic style) furniture. 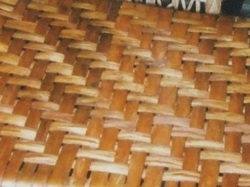 Reed splint (rattan) in a diamond pattern. It comes in a variety of widths and is one of the most common splints used. Accepts stain, paint and varnish much like wood. Hickory splint, twill pattern. Hand peeled in 1/2"- 3/4" widths. Upon drying, there will be gaps due to shrinkage, and with its unique color will give a very distinctive, durable seat. 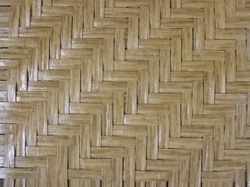 Binder cane woven in a unique pattern. Binder cane comes in 4,5, & 6mm widths and is uniformly hewn unlike wider slab cane. 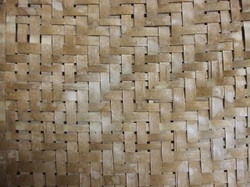 Flat fibre splint (paper) twill pattern. It comes in a variety of widths and easily accepts stains, paint and varnish. Durable and easy to use. Splint seats are generally made from materials that are flat and of any width. 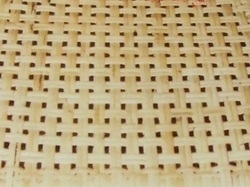 The most common are reed splint (the core of rattan), paper and binder cane. Also used are splints from a variety of wood specie, cotton shaker tape, and resin. The most common designs are twill and basketweave but there are many more for the customer that desires something distinct for their chair. Color and finish is virtually endless to add another layer of uniqueness. Material is available for those that want to do it themselves.